LOS ANGELES (AP) — Although the Los Angeles Lakers haven’t won many games with defense over the last half-decade, LeBron James can inspire his new teammates to all sorts of feats that seemed impossible not too long ago. 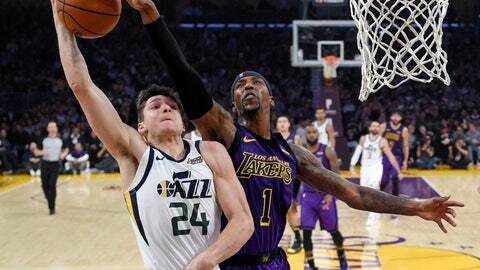 James had 22 points, 10 rebounds and seven assists, and he seized control of an ugly game with nine points in the fourth quarter of the Lakers’ seventh win in eight games, 90-83 over the Utah Jazz on Friday night. Brandon Ingram scored 24 points while the Lakers struggled in their first game back from an Eastern Conference road trip, but still persevered to earn the final win in this franchise’s first 7-1 stretch since the last eight games of the 2012-13 season. Although the Lakers have shown signs of being a dynamic offensive team around James, there wasn’t a sign to be seen against the undermanned Jazz, other than Ingram’s uncommonly aggressive performance. The Lakers committed a season-high 24 turnovers and managed just 10 assists all night, struggling to get out on the break and foundering in half-court sets. So they produced one of their best defensive games of the season, holding Utah to the fewest points scored by an LA opponent since last February. Donovan Mitchell scored four points before he bruised his ribs in the second quarter and didn’t return, depriving the Jazz of their top producer and compounding their already formidable offensive struggles. The Jazz won’t provide an update on Mitchell’s condition before Saturday. Burks scored 17 points and Joe Ingles had 16, but the Jazz have lost three straight and five of six. Jazz: Mitchell was 2 of 9 and committed two turnovers before his injury. … Rudy Gobert had 13 points and seven rebounds. Lakers: Josh Hart played 14 scoreless minutes despite a strained tendon in his left ankle. … After returning at 4 a.m. Thanksgiving morning from a trip to Florida and Cleveland, Los Angeles has begun a stretch with six of seven at Staples Center. … JaVale McGee had 12 points, and Ball added nine points and 10 rebounds. Neither team did much to distinguish itself early on the first game back from Thanksgiving. The Lakers held Utah under 30 percent shooting for most of the first half, but then blew an 11-point lead in the final 3 ½ minutes while committing 13 turnovers in the first half. Ingram and Lonzo Ball were Los Angeles’ biggest contributors early, with both youngsters going hard to the hoop. James had only four points in 16 minutes at halftime, and he had only five assists on the first 21 field goals by the Lakers’ stagnant offense. While the Lakers had their own success on defense, the Jazz are among the NBA’s premier defensive teams. Utah held the up-tempo Lakers to 13 fast-break points and just five offensive rebounds in addition to LA’s 24 turnovers. Jazz: At the Sacramento Kings on Sunday. Lakers: Host the Orlando Magic on Sunday.